For Hong Kong, we are the world’s number one destination eight years in a row, handling nearly 60 million visitors per year. Many of them might be coming to our city for the second, third or many times. We also have this very gigantic number, 60 million visitors, against 7.4 million of the total population, which is eightfold of our local residents. I believe some experiences Hong Kong has encountered might be of relevance to our common challenges in this business. So I will point out four areas. First, tourists these days begin their journey well before they set foot in a city. I say so because the tour journey starts usually not by plane, nor from any hotel, but actually it starts at the desktop computer, the cellphone, the pictures on Instagram or Twitter, through word of mouth and also comments on social media. So actually the journey starts well before they set off. My second observation is that tourists know far more than before, fortunately or unfortunately, not from official channels, but from, for instance, Twitter. In fact, non-official information actually plays a more significant role than what we, the governments, are providing. The third observation is that tourists do not just come to see. The old description of sightseeing is a bit outdated because nowadays you can see a lot of things on the web. People come here to experience. Last but not the least, tourists these days instantly share their experience, real time, by split seconds, with their friends in other parts of the world. These are the major challenges that we are facing. I would also add that the typical Hong Kong experience in this business includes a highly internationalised tourist mix and a very large group of Mainland visitors. 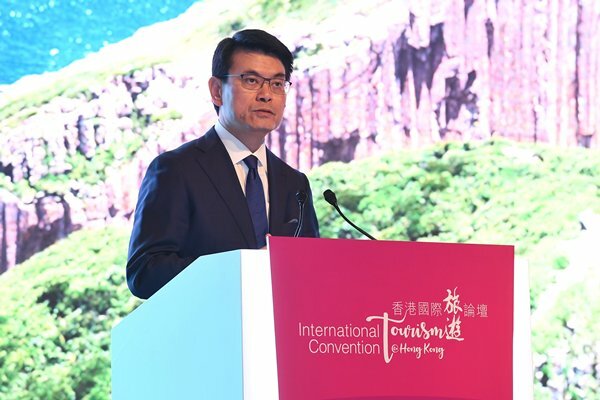 The Chief Executive mentioned just now that this year we might be seeing 60 million tourists coming to Hong Kong, with 47 million of them from the Mainland. The other 13 million are overseas visitors coming to Hong Kong, and although they capture a smaller share, it is not a small number by itself. So we are facing a very dynamic internationalised clientele coming to Hong Kong as tourists. The second experience that Hong Kong is having is that even Mainland visitors coming to Hong Kong are looking for some non-Mainland experience, because Hong Kong is not just another Chinese city. There is some uniqueness in every city, Hong Kong in particular. The third challenge we are facing is that tourism nowadays is highly cross-region and highly cross-culture. This is self-explanatory and I won’t go into details. Lastly, Hong Kong is taking advantage of the multi-destination travel that we are talking about in today’s forum. Multi-destination means that people do not come to a single city for tourism experience. They are hopping on – using a place to go around. A figure that I can quote is that 49%, almost half of the short-haul visitors coming to Hong Kong are having multi-destination travel. For people coming here even for a very short while, say, a few days from nearby countries, almost half of them do not stop only in Hong Kong. For long haul visitors, 88% of them coming to Hong Kong are also multi-destination travellers. This backdrop gives us the context to talk about the Belt & Road Initiative and the Guangdong-Hong Kong-Macao Greater Bay Area development. I would also share four observations and experiences with members here as a kick-off for the ensuing discussion. First, every bridge connects. I say this because Hong Kong is actually having the privilege of two major cross-boundary infrastructures commissioned in the last two months, the Express Rail Link (Hong Kong section of the Guangzhou-Shenzhen-Hong Kong Express Rail Link) and the Hong Kong-Zhuhai-Macao Bridge. I say every bridge connects to emphasise that infrastructures, particularly roads, railways, bridges, airports and sea ports, are important infrastructures supporting tourism. And to a certain extent, some of these infrastructures by themselves are also tourist attractions. For our case, the bridge connecting Hong Kong, Macau and Zhuhai is heavily patronised by first-time visitors, who come not just to Hong Kong, Macau and Zhuhai, but simply to have an experience of the bridge. In the initial months after the bridge opened, we had a survey which showed that about one-fifth of the visitors actually come for a single day, just to travel upon the bridge. It also says how important the investment in infrastructures that connect cities, regions and countries is, and how such investment boosts and changes the tourism landscape. The second observation also starts with every: every visitor counts. That might be easier said than done. It might be just lip service, but with the experience I mentioned, with the very interesting background that we are having among our modern day visitors, every single visitor’s experience in a city or country actually counts. They bring back home their experience after visiting a city, and the experience they share and the comments they make on social media are also important. So that calls for a quick response from any government or tourism industry player in tackling problems, as well as leveraging on advantages. It also calls for inter-governmental co-ordination; streamlining of cross-boundary procedures; collaboration with the travel industry; enforcement of regulations and gauging tourists’ feedback. The third observation also starts with every: every bit local. It is in fact a tagline we used in one of our tourist promotions in the Sham Shui Po area in Hong Kong, a very localised district. While the world is getting highly globalised, travellers and visitors tend to focus on things that are local rather than metropolitan or international. People simply like to travel, shop, eat or dine like a local. So we discover the cities with very interesting facets that might not be revealed to visitors in the old days. We are talking about local culture, local delicacies, local traditions, local festivals, local designs or street corner cafés. This is in fact relevant to the new tagline that we are using in rediscovering our city tourism. The final observation is every difference makes a difference. Here I am talking about the diversity in any city and in our region. We are talking about rejuvenated heritage, in which Hong Kong, Macau and also Guangzhou have invested a lot. We are talking about the contrast between town and country. Yesterday night when I hosted a small dinner for incoming speakers, I talked about the wow factors created by the very stunning landscape on some of our coastline in the northeastern part of our territory, which surprised a lot of people as the common perception about Hong Kong is a metropolitan city. Actually, the hexagonal columns in the (Hong Kong UNESCO) Global Geopark in Sai Kung area are more spectacular than our skyscrapers on both sides of the harbour. These are the wow factors and differences that people coming to our city are getting. It also includes all the things about cross culture, about East meets West, and nature, which brings a contrast to a metropolitan city. To conclude, these are small things that might be too easy to neglect by policy makers or the tourism industry. But these are all little things that a big city destination like Hong Kong is facing day-in and day-out. But nothing is better than having all these dots connected and these experiences shared in the forum today. We hope this would be one of the dots that would connect Hong Kong with the neighbouring cities in the greater bay area. We hope this would connect Hong Kong and the tourism industry around the world when we explore the vast markets along the Belt & Road. Secretary for Commerce & Economic Development Edward Yau gave these remarks at the Hong Kong International Tourism Convention on December 12.